So, issue #19, or The Issue That Would Have Been The 900th. As someone unaware of the previous story arcs in the series, I was quite unprepared for all the Man-Bat goodness in this issue. Layman and Fabok (and all the other guest artists like Andy Clarke) essentially are dealing with the character’s origins here, from when he was Dr. Kirk Langstrom and they show, across several short tales, how he turned into Man-Bat, and how he was brought to that point by forces outside of his control. There are quite a few references in this issue to events that have taken place in Batman, Incorporated by Grant Morrison, and so some of them were lost on me since I haven’t read that title, but overall, this was a pretty solid issue. Layman gives some great depth to Kirk Langstrom/Man-Bat and even develops his wife and assistant, Francine, a little. And let’s not forget Batman either. He’s still hurting after the events of The Death of the Family, which saw the break-up of a lot of the trust between the various members of the Bat-family, and the death of his son, Damian. Layman references all of that and shows how they are all doing their bit to fight the Man-Bat but have no interest in patching things with Bruce, not now. Quite an emotionally-packed issue I’d say, despite all the great high-octane action. Layman also does well to balance all that against a guest appearance by Batwoman, aka Kate Kane, who has often been Batman’s professional adversary, but ends up teaming up with him for the main story. Some good, decent character stuff there. Even James Tynion IV’s short story (the third) about Bane and his plans to take on the Talons was a good one, with art by Jason Masters, Brett Smith and Carlos Mangual. It doesn’t match up with the others since they are all about Man-Bat and this one is about the supervillain who once broke Batman’s back, but I enjoyed it all the same. Definitely far better than the Bane one-shot we get on September. I particularly enjoyed the artwork, which had a very atmospheric feel to it and many of Bane’s scenes were coloured through as if viewed via a looking glass or something. It adds character to the story itself and helps it stand-out. And the artwork is just fantastic. 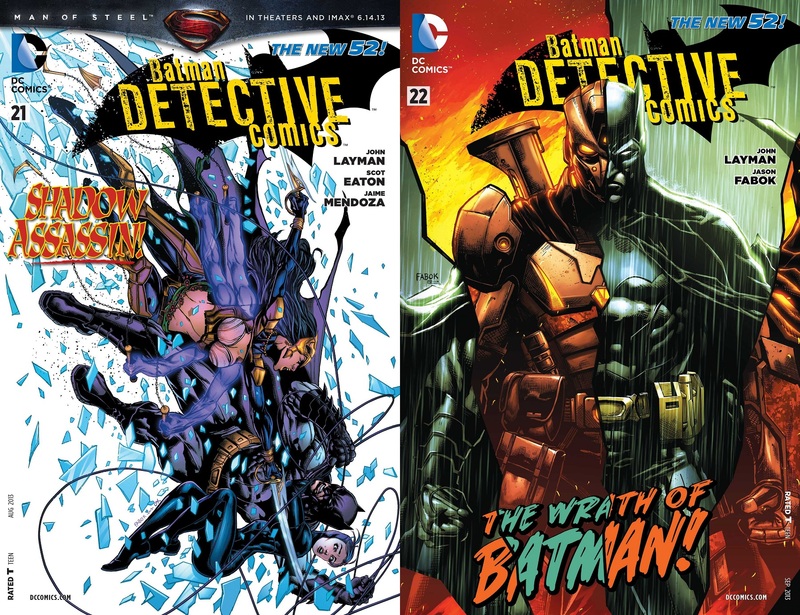 Fabok, colourist Jeromy Cox and letterer Jared Fletcher work on the main story with there being four other art-teams for the four short stories that are aside from the main story. Each and every artist does their bit to make this a really good anniversary issue and I loved all of it. There’s just way too much goodness here in all respects. Usually, with an anthology-style issue like this, the art styles can vary wildly and some of those times the art can be very inconsistent, but that’s not the case here. Each penciller brings their own quirks and style to the issue, and so do the inkers and the colourists, but there is an incredible amount of consistency between them. Unless you really focused on the details, you can’t tell the differences! So, a job well-done to everybody. Issue #20 goes back to the Emperor Penguin arc and closes that one out. It seems a bit weird to include it in the fourth volume instead of the third, and I was lacking a lot of the backstory context for it, but Layman still wrote quite a good story that almost seems to stand on its own as a one-off. And it kind of does tie in to his Birdwatching story in the previous issue, which did feature Emperor Penguin, so its not as if the story in this issue is completely divorced from the rest of what is going on. There is a hell-ton of awesome action in this issue as Batman and a souped-up Emperor Penguin aka Ignatius Ogilvy go head-to-head against each other. Fabok does some incredibly cinematic fight scenes and the throwdown between the two characters is definitely something that you would want to watch on a big screen. As the closing arc for the character, things are noticeably ending on a high note, whether its the big confrontation, or Ogilvy’s time in Blackgate. The latter is told in a backup story (Layman, Andy Clarke, Blond, Dezi Sienty), and it gives a lot of background matter on Ogilvy, into the things that made him what he is today and we get some good explanations of his motivations. Still, we do get a lot of action nonetheless, in keeping with the rest of the issue and Layman continues his strong run. Issue #19 gave me a lot of reasons to love Layman’s writing, but it is #20 that really solidified that fascination. Fabok’s art, along with colours by Jeromy Cox, and letters by Jared K. Fletcher, is impressive yet again, as I already mentioned. Fabok is a perfect fit for this book from what I’m seeing. His art has a lot of unrestrained energy to it, something that you don’t quite see in Capullo’s work on the main Batman title and this is one of his strengths, and for the book too. Issue #21 is a transitional one-shot in which we meet up with an assassin dispatched by the League of Assassins (presumably, with ample hints being dropped along the way) to take care of Bruce Wayne, the man she fell in love with years and the man who (accidentally) killed her. Now she wants revenge, after a fashion. The issue also marks the return (?) of Harper Row and her brother Cullen, who debuted in Snyder/Capullo’s Batman #12 with the majority of the art in that issue drawn by artist Becky Cloonan. Harper is quite a fun character and more than Batman, she is the star of this issue. Its nice to see Harper being written by someone other Snyder, who has done well to develop her in his own issues. It delineates the fact that she is now an established part of the Batman lore and that she is open for inclusion in stories that are not written by Snyder. Good stuff really. As with the last two issues, this one too is quite a solid read and fast-paced as well. Heart-breaking ending that drives another nail in Batman’s coffin of emotions and one that I enjoyed. It has some of the weirdness I like about Batman stories, when his opponents aren’t always of the “mortal” variety, but come backed by some magic as well. Scott Eaton takes up the pencilling duties for this issue, with Jaime Mendoza doing the inks alongside the series regulars Cox and Fletcher. Eaton prefers a more muscled look for Batman, even when he is in costume and a few times it can get quite ridiculous since his proportions end up being overblown, but all his characters are quite dynamic and lively all the same. Lots of inking and dark colour palettes in use once again so Cox and Mendoza do their own bit as well, helping make this issue one of the better Batman stories I’ve read to date. The issue features a backup in which Kirk Langstrom tries to make sense of his changed life and tries to find out who has been killing people in the city, all of whom were clawed to death. He fears that it is him who is doing the killing, that he becomes lost in the persona of the Man-Bat when he transforms. Layman continues to tell the tragic tale of Kirk Langstrom and the way that everything unfolds, you can’t help but feel sorry for the man, for everything that he has gone through. Andy Clarke draws this issue, with colours by Blond and letters by Taylor Esposito. A solidly drawn issue, with perhaps a little too much inking and shading in places, but it fits in with the artwork on the rest of Layman’s run, as under Fabok, so its all cool in the end. 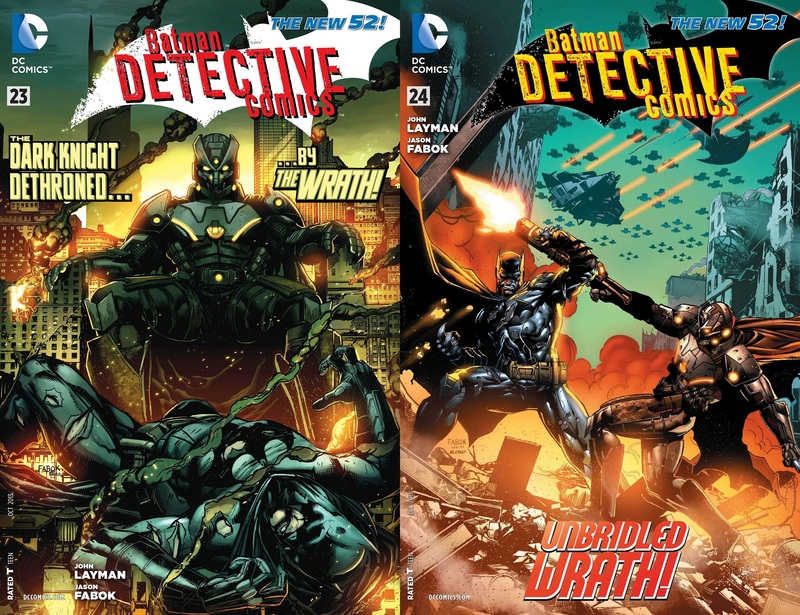 Issues #22-24 are about a new villain, called Wrath, who has been organising the deaths of various Gotham cops, whether through intermediaries or on his own. This is quite an involved story for the most part and Layman paces it almost perfectly. All the revelations that come, all the action that comes, all the mystery that is a core part of a story like this, it is all handled well and the writer hits all the right beats with it. The story seems somewhat of a cliche and similar to what we saw in Snyder/Capullo’s Batman Volume 2 but it does have some significant differences. So despite the similarities, the story stands on its own and it gives both Batman and Alfred (his call-sign is Penny One, which I kind of find hilarious), a lot of narrative depth. Simply, throughout this 3-issue arc, I enjoyed how Layman portrayed everybody, especially the characters E.D. Caldwell and Wrath. Layman know how to write his characters well and he makes his villain come across as both badass and creepy, someone you really have to be wary of because they can always hit you at your weakest points, and that’s what Wrath does to Batman. Like Emperor Penguin before him, Wrath hurts Batman where it hurts most, his reputation and his public perception. He essentially starts to turn the cops against Batman. Quite an ingenious plan, all things said and done. One of the best parts of this arc is that we get to see Batman’s Tumbler in action, the same vehicle that Christian Bale’s Batman drives in the Christopher Nolan trilogy. I love the Tumbler and its great to see it pictured here as well. Fabok draws some great scenes with it in this arc. One of the highlights for sure. And the absolute best part, and completely unexpected no less, is a high-speed aerial duel in the skies of Gotham. Batman has the Batplane and Wrath has his own… fighter. Some really fantastic scenes right there. I had no idea that Layman and Fabok could ever have pulled something like this off, but they do, and it is, in a word, glorious. This is the moment where the thrill of everything really ramps up, where you really get a sense that Layman is out to make full use of all aspects of Batman, and all his toys as well. That’s how this arc ends. With a pitched battle between Batman at his best and Wrath at his best, with full usage of their unique toys. I wouldn’t have had it any other way either. Its a very satisfying conclusion to the story. The second epilogue has a meeting between Wrath and Emperor Penguin, something that actually did give me some chills because of how it was written, and drawn. No frills, no flash. Just a lot of character drama and intensity. The backups in #22 and #23 continue the tale of Kirk Langstrom. We have already seen him at a low point, and now we see how his wife also starts getting corrupted with the power she has as the She-Bat. Layman is building up to another epic confrontation here, something that eventually gets dealt with in the Man-Bat Villain’s Month one-shot from September (review), which was written by Frank Tieri. That one closes out that subplot, but it is fun to see how Layman sets it all up. And Andy Clarke’s Man-Bat and She-Bat are phenomenal looking, so yeah, great stuff. If anything, Fabok’s Bruce Wayne is much more visually intense in this arc, both in terms of his facial expressions and his body language. Its a subtle effect, but it is there, and it enhances the narrative considerably. I want to see an intense Bruce because it helps break the general mold of the character from what all the other current artists who are drawing Batman are doing. Emilio Lopez is on the colours for the #22 issue and while I kind of miss Jeromy Cox, Lopez does do a good job in the end. And he does the cover for #23 with Jason Fabok, so he does seem to be in rhythm with the main artist on the series, which is always good. 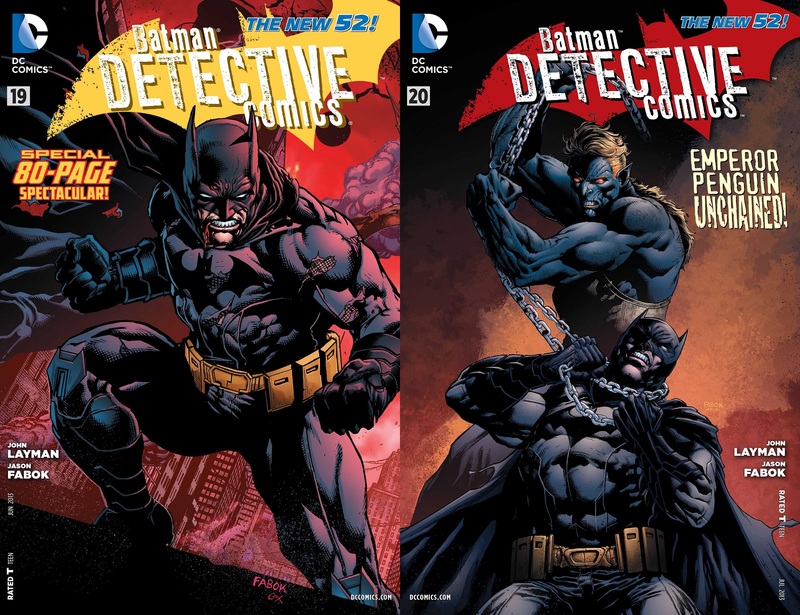 Overall, taking these six issues into consideration all together, Detective Comics Volume 4 contains some of the best Batman stories I’ve read to date. In fact, for anyone looking to jump in on Batman comics, this is definitely something that I’d offer as a good place to start off. Lots of great stories, with a wide range of art from a ton of artists, and just plain lots of diversity. And people like their superheroes with action today. Well, this volume has both action and intense character drama. So it gets everything right, for the most part. Posted on December 12, 2013, in Comics Reviews, Review Central and tagged Alfred Penn, Andy Clarke, Batman, Blond, Comics, Comics Review, Detective Comics, Dezi Sienty, Emilio Lopez, Emperor Penguin, Gotham, Graphic Novel, Graphic Novel Review, Jaime Mendoza, James Tynion IV, Jared K. Fletcher, Jason Fabok, John Layman, League of Assassins, Penguin, Review, Review Central, Scott Eaton, Superheroes, Wrath. Bookmark the permalink. 2 Comments.